Almost caught up this week. The Building network is slowly coming alive. I have confidence we'll be ready to go for the start of school next Tuesday. As you may suspect, I am a highly sought after staff member as we get everything that is technology ready for the new beginning. The Jury Watch has begun in the Murder case of Dru Sjodin. The defense rested after calling only one forensic witness. The defense is not disputing the crux of the charges. They are merely challenging the Federal portion by claiming that Dru Died in North Dakota and therefore is not a death penalty case. We'll see if the Jury agrees later today. I doubt this will go past dinner time. My son is now off Cape Horn doing some training. They await there orders which may include a trip to Iraq, but no word yet. FREE DRUM CORPS: Minnesota Brass, Inc. is holding their final rehearsal this evening before heading off to World Championships in Rochester, NY. The corps will begin at Edgewood Middle School until about 8:00 and then head over to Irondale High School for a Full Uniform Performance. The corps will then do some final coordination work followed by another full performance of the show. This open Rehearsal is FREE to the public, but food shelf donations will be excepted. Here is your final chance to see Drum Corps in Minnesota this season. I'll be there, hope to see some of you as well. Back to work for me. Maybe more later. BOULDER, Colorado (CNN) -- Schoolteacher John Mark Karr will not be charged with the murder of 6-year-old beauty pageant competitor JonBenet Ramsey, Karr's attorney said Monday. "The warrant on Mr. Karr has been dropped by the district attorney," public defender Seth Temin said outside the jail. "They are not proceeding with the case." He said a hearing scheduled later Monday afternoon has been canceled. Colorado authorities have not commented on their decision not to pursue charges against the man named in a warrant alleging murder, kidnapping and sexual assault on a child. But CNN's Denver affiliate, KUSA, reported that the DNA sample taken from Karr does not match DNA found on JonBenet's body. KUSA quoted two sources in a bulletin on its Web site. KUSA reported that samples of Karr's saliva and hair were taken in Boulder after his arrival Thursday evening. Those samples were tested over the weekend by the Denver Police Department's crime lab. Those tests ruled out Karr's DNA as the foreign DNA left on JonBenet's body when she was slain in December 1996, the station reported on its Web site. You would think that a DNA match would make a pretty solid case, but the lack there of shouldn't necessarily exonerate him either. With that, it does appear more each day that Karr may have been looking at a way to get out of his legal troubles in Thailand by creating this whole scenario. This chapter of the mystery isn't quite over yet. Senate poll is in line with other 'moment in time'. The Governor's race has been all over the place, but at some point it has to settle down. That point may not even be till November. Posting will be intermittent as I am back to work setting up the building for a new school year. Tonight after the Twin's game, the three DFL Candidates vying for dibs on the November ballot will square off. Tune in to the John Rash Show on WCCO around 10:00PM to catch all the action. The Minnesota Monitor is online. Be sure to check out what will evolve into the first stop shop for all your left and left leaning blogging needs. A crack team of writers committed to kicking out well researched posts in a timely and prompt fashion. You'll find many of your favorite writers over there, REW, MNCR, BotML, and many others. Go check it out. As for me, I'll be stuck in the Internet Black Hole again, so not much till later this afternoon. LOS ANGELES (Reuters) - Jazz trumpeter and big-band leader Walter "Maynard" Ferguson, famed for his screaming solos and ability to hit blisteringly high notes, has died at age 78, associates said on Thursday. He became known with the Kenton band for being able to hit "ridiculous high notes with ease," according to jazz critic Scott Yarnow. The Penguin Guide to Jazz says of Ferguson: "There are few sights more impressive in animal physiology than the muscles in Maynard Ferguson's upper thorax straining for a top C.
"... Putting a Ferguson disc on the turntable evokes sensations ranging from walking into a high wind to being run down by a truck," according to the Penguin Guide. Among Ferguson's best known and most commercially successful recordings were "MacArthur Park" and the "Rocky" movie theme, "Gonna Fly Now." I saw Maynard live several times. Most memorable was at the old Met Sports Center to a very sparse crowd. At first I was disappointed that there was only a few thousand people there, but it turned out to be a blessing. The concert turned into a very intimate and personal performance, with Maynard venturing into the audience a few times to 'squeal' right from the aisle and greet many of us in attendance. In 2003, the last time I performed with Minnesota Brass, we played a portion of another of Maynard's hits, Conquistador. I'll be digging out some of my old Maynard stuff the next few days. He will be missed! I'm heading out to the fair, soon. I always prefer going on opening day. Everything is as clean as it is going to get, food is the freshest, workers are the friendliest. I generally start in the animal barns and work my way across the grounds until I find myself on Machinery Hill. It will be a full day. I am hoping to stop at the 5th CD DFL debate. If so, I may have more to share later, but for now I need to get out of here. and then there was Eight! Astronomers meeting in the Czech capital have voted to strip Pluto of its status as a planet. About 2,500 experts were in Prague for the International Astronomical Union's (IAU) general assembly. The scientists rejected a proposal that would have retained Pluto as a planet and brought three other objects into the cosmic club. Pluto has been considered a planet since its discovery in 1930 by the American Clyde Tombaugh. The ninth planet will now effectively be airbrushed out of school and university textbooks. I've been hoping for a Planet X, now we don't even have a planet IX. 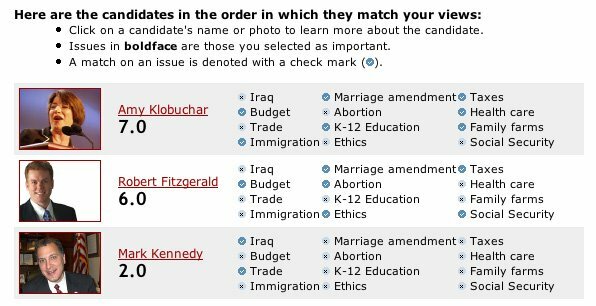 I took MPR's Select a Candidate survey for the US Senate race. Here are my results: Those that no me well will not be surprised to see my match with Congressman Kennedy on Iraq and Trade, but after that we part ways pretty strongly. I was slightly surprised to see Robert Fitzgerald right up there with Amy. Mr. Fitzgerald is a very formidable candidate and has a bright future ahead of him. When he visited Drinking Moderately last Spring he even had the Right Leaners engaged in his refreshing outlook for the future. 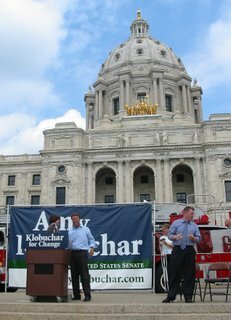 But the choice is clear, there is only one candidate who can best represent the constituency of this state, and that is Amy Klobuchar. As long as Kennedy stays so out of touch with the citizens of this state, his numbers will continue to fall. 30 Computers, no Internet, one external Hard Drive. That is where I was yesterday as I re-imaged the old Lab machines in preparation for the beginning of the school year. I DID have my MP3 player which also doubles as an FM radio. 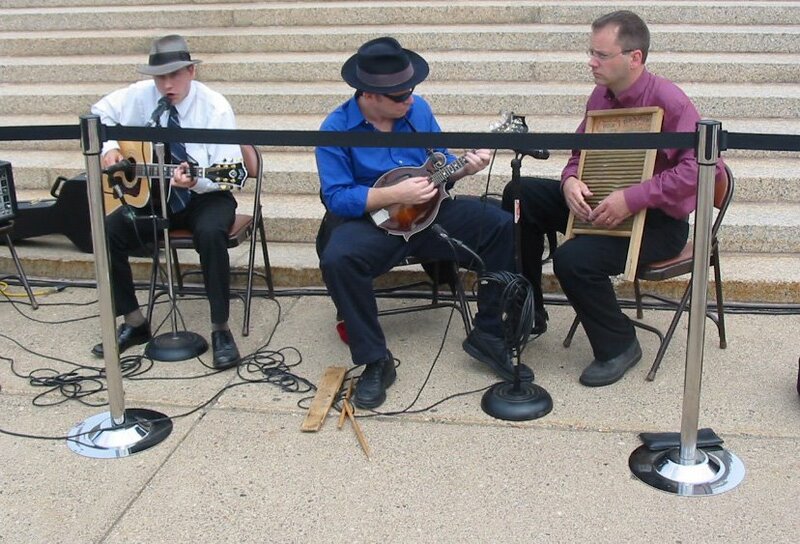 I stumbled on Mike Hatch's appearance on MPR. I've been flying below the radar on the Governor's race. I have my choices narrowed down to Mike Hatch and Sue Jeffers. Hatch made a great case for himself on MPR, it is a must listen. More work today, school starts in two weeks. Oh Joy. In Congress, the gas and oil companies have immense influence with large campaign contributions. These companies have been allowed to create and regulate America’s energy policy. The result has left Minnesotans emptying their pocketbooks while no significant changes are being made to help them. Minnesotans deserve leadership. It’s clear we cannot wait for Washington to solve high prices at the gas pump. Just as Minnesota led the fight against big tobacco companies who prey on our children and HMOs who mistreat patients, we must lead the fight against price gouging and monopolies in the oil industry. First, we must investigate oil company practices that drive up gas prices. The decision by BP PLC to temporarily shutdown an Alaskan oil field because of a leak in one of the pipelines has caused a spike in gas prices. Reports indicate that corporate unwillingness to make repairs in a lax regulatory environment was the cause of the incident. SAN FRANCISCO, California (AP) -- Photographer Joe Rosenthal, who won a Pulitzer Prize for his immortal image of six World War II servicemen raising an American flag over battle-scarred Iwo Jima, died Sunday. He was 94. "He was a good and honest man, he had real integrity," Anne Rosenthal said. His photo, taken for The Associated Press on Feb. 23, 1945, became the model for the Iwo Jima Memorial near Arlington National Cemetery in Virginia. The memorial, dedicated in 1954 and known officially as the Marine Corps War Memorial, commemorates the Marines who died taking the Pacific island in World War II. The photo actually shows the second raising of the flag that day on Mount Suribachi on the Japanese island. The first flag had been deemed too small. A few interesting comments in my post on Cousin Tim's run for Brooklyn Center Mayor. I served on the Planning Commission with Tim for almost 10 years. I had no idea you were related. Tim runs a tight ship, which two of our current Council members will soon find out if he wins. One of them, a person equally lacking in propriety and perspective, beat him last election. Revenge is a gavel best swung cold. I honestly haven't decided yet. Both would bring unique good traits to the job. I supported Kathleen in the last election too..but this time I'm voting for Tim..I think he has what BC needs right now to turn this city around. K v Polygraph was so incensed at being violated by what they claim to be 'Turkish Hackers'. Recently Tony Garcia was invaded by a hacker and soon after AAA's Residual Forces (a primary contributor to K v Polygraph) was splashed with the same template used at ARUC. 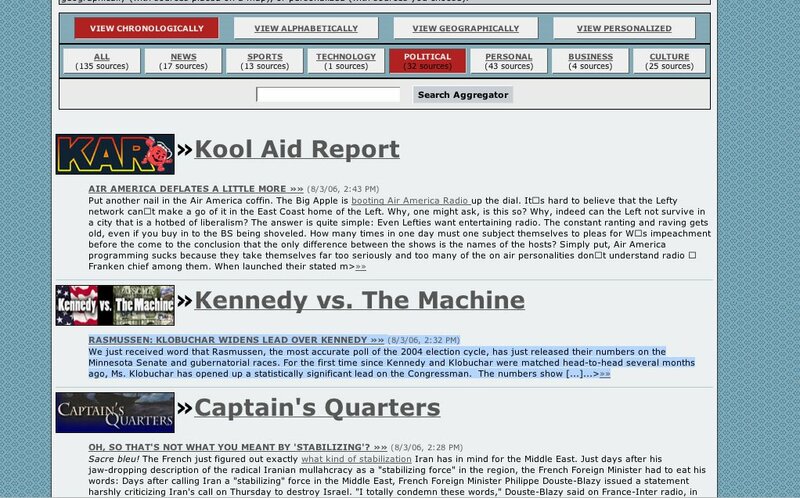 Now the Residual Forces URL is a clone of Kool Aid Report. Could this mean that we have found the hacker? Could LF actually be a member of the 'Machine'? Will we be seeing a Koolaid pitcher on the banner at K v Polygraph replace the yellow crescent they were so quick to put up during the last Hacktackular fest? Answers anyone . . . .
A federal judge ruled Thursday that the government's warrantless wiretapping program is unconstitutional and ordered an immediate halt to it. U.S. District Judge Anna Diggs Taylor in Detroit became the first judge to strike down the National Security Agency's program, which she says violates the rights to free speech and privacy. There are procedures and processes in place, including retroactive permissions that can be used under the law. There was no reason for anyone to bypass this process, especially the President, who took and oath to uphold the law, only to ignore it. I doubt we have heard the last of this. As you are now aware, John Mark Karr was arrested for the murder of JonBenet Ramsey. The DA's office, in the conjunction with many other agencies in locating and identifying Mr. Karr. There is much more work to be done! Our preference would be to continue to work outside of the public eye, but we know that is not possible. I am not commenting on the particular nature of this arrest. We are absolutely overwhelmed by the selfless dedication of the hard work of these investigators. We can not adequately express out thanks. Thank you to DA investigator Mark Spray, leaving DIA for Thailand with little more the four hour advance notice last Monday. We can't comment on evidence at this time. Prohibited to tell you under Colorado law, can not discuss the possibility of a guilty plea or opinion as to guilt. I can not discuss a confession or a refusal to make a confession. I can not discuss forensic tests that are being performed or the results of tests or the failure or refusal to take a test and I can not talk about anything in regards to evidence in the case. I half thought there would be some kind of an apology to the Ramsey family, but they seem to not be quite ready to let go of that. We just may be closer to the truth then we have ever been in this case. I'll be watching the gear of justice churn on this one. In a stunning development, a 41 year old teacher was arrested in Thailand on suspicion of murder. John Mark Karr , a 41 year old teach claims "I was with JonBenet when she died"
Karr's arrest Wednesday came nearly a decade after the 6-year-old girl's body was found in the basement of her Boulder, Colorado, home -- setting off a media sensation. The arrest also came less than two months after JonBenet's mother, Patsy Ramsey, died of cancer at 49. Karr told The Associated Press he wrote Patsy Ramsey before she died to express his remorse. "I conveyed to her many things, among them that I am so very sorry for what happened to JonBenet," he told the AP, which described him as sweating and stuttering. If this turns out to be THE big break in the case, imagine the horror the parents have gone through over the past 10 years while under the 'umbrella of suspicion'. 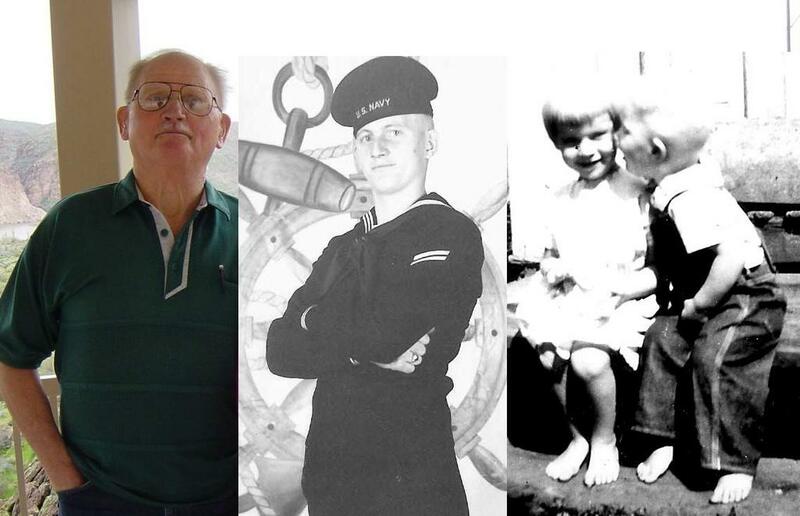 It is even more frustrating that Mom passed away before she could be vindicated. I'll be watching the Colorado press conference in a bit, to see if there are enough specifics to close this case. 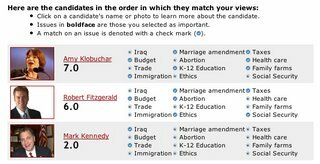 Remember when we asked readers to send in how Amy Klobuchar differs from her hero Mark Dayton? Probably not since no one responded. OK, I respect these guys and don't think for an instance they may have gotten several responses and are just choosing not to post them. The gentleman I have met have much more integrity then that. But I do believe there may be a level of apprehension on the part of their left leaning readers to even bother sending them anything. SO I CHALLENGE THEE! Why don't you open up comments?!! I run Luther -v- Johnson and have activated comments on a particular post, why not do the same. I can appreciate that some blogs prefer not to have them. But that doesn't mean you can't arbitrarily choose to have interaction for a post now and then. Guys, what do you think!! "Shall the Minnesota Constitution be amended to dedicate revenue from a tax on the sale of new and used motor vehicles over a five-year period, so that after June 30, 2011, all of the revenue is dedicated at least 40 percent for public transit assistance and not more than 60 percent for highway purposes?" I think it is pretty clear. I also think it is a pretty good idea. I'll be voting YES! I spent a good chunk of Saturday afternoon putting up lawn signs. My first cousins husband is running for Mayor in Brooklyn Center. He has a pretty good shot, and aside from being family he is the best person on the ballot. If you live in Brooklyn Center, consider looking at Cousin Tim as your next Mayor. I think you will find he is clearly the best opportunity that Brooklyn Center has to offer. On a night when many corps moved up or down in the rankings, the Cavaliers of Rosemont, Ill., rose above the scuffle and maintained their first-place status to win the 2006 DCI Division I World Championship with a final score of 97.200. But the season isn't over. The All Age corps continue through Labor Day. Experience the Marching Arts LIVE next weekend. Long time readers know that I have been involved in the Drum and Bugle Corps activity for over 25 years. Although I began the season hoping to perform with Minnesota Brass, Incorporated during their 60th anniversary season, it was not to be. With three teenagers in the house, and my more active involvement in the political world there just wasn't enough room to squeeze in a competitive drum corps season. As we enter August, the season is winding down. Minnesota Brass is a Senior corps, and their World Championships will be held in Rochester, NY Labor Day Weekend. If you've never seen Drum and Bugle corps before, or if you have an inkling to see them again, you still have an opportunity. Members of the Central Region of the All Age Drum Corps Associates will be traveling to Minnesota for a weekend of marching arts. Tonight is the finals competition where the 2006 DCI World Champion will be crowned. ESPN 2 will show highlights and full corps performances, September 5, 2006. Be sure to tune in, you will never think of marching band in the same way again! Tomorrow the DFL State Central Committee convenes to consider endorsement of a Attorney General Candidate. It is my hope that clear heads prevail, and that the members allow the people of Minnesota to make the call on this one. This is real simple. All three candidates will remain on the ballot regardless of what happens Saturday. All three candidates are competent and qualified to hold the office. However each candidate brings their own strengths to the table. For a small group of party loyalists to meet in August to throw a dart on this one deprives the DFL electorate of a fair and untarnished view of these candidates. I am joining others in the Minnesota Blogosphere requesting the DFL State Central Committee to take a pass on this endorsement. The voting public will have ample time to vet these candidates during this short election cycle. They are the ones who will be served by the primary victor. Let's give them the opportunity to select the most qualified and competent candidate to server as AG. This Saturday will be an acid test. If they endorse an AG candidate — any of them — they will have failed. There is absolutely nothing to be gained by endorsing one of three such highly qualified candidates. An endorsement will be one big F### you to everyone in the party that disagrees with the party apparatus. And again, if they endorse, I'll be voting for one of the two other folks, regardless of who they pick. Democracy means letting the people pick. 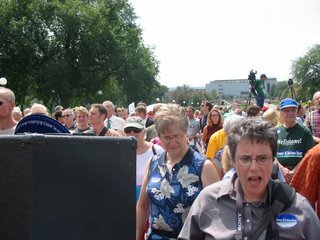 Not the media, not the DFL, not some jackass in DC. When you do the picking for the people, they tend not to care so much, and then you lose. I'm tired of losing, even if the DFL isn't. There will be a primary, so it's not like an endorsement will end that. I can certainly see why some people think an endorsement at this stage is a bit pointless. I hope the SCC will vote for no endorsement. All the candidates will be on the ballot no matter what, and that only one candidate is actively seeking the endorsement. The DFL delegates already picked a candidate for AG at the State Convention. He turned out to be not such a good choice after all, but I don't think it's right for the SCC to make the choice in the name of all the delegates who will not get to decide the second time around. I don't have a preference in this race yet, but I think all the candidates are fine Democrats and would make a good AG. As a blogger, it’s incumbent on me to tell people what to do even if they don’t care, and as an alternate to the committee, I might even be able to affect the outcome. Either way, I know who I plan to back. It’s not that I don’t have a lean on this race. Put a gun to my head, and I’d probably back Steve Kelley right now. But there’s no gun to the DFL’s head, and no good reason for us to pick a front-runner in this truncated contest. All three candidates are appealing. Steve Kelley ran hard for Governor and impressed people with his gracious exit from the race, and he deserves much love for leading the charge against Cheri Yecke. Bill Luther is a former congressman with a solid record of accomplishment, and a skilled campaigner. Lori Swanson is the rawest politician of the group, but having served as Solicitor General, she might be the best-qualified to serve. Each candidate brings something valuable to the table, and all are superior to the candidates the Republicans are fielding. the SCC should not endorse before the primary. I'm right there with you. No endorsement. One of the arguments that I've heard for endorsing is to get full financial support from the DFL. The DFL should just fully support the DFL candidate that the people choose on Sept 12. The DFL State Central Committee meets tomorrow in Sauk Rapids. There are three impeccably qualified candidates for Attorney General. Everything I’ve heard, read and been told has confirmed that any of these candidates would be both good for the job and would be competitive against Jeff Johnson. * I am advocating for no endorsement and automatic endorsement for the winner of the primary. Here's a few pics. My camera died on me even though I had put freshly charged batteries in it. I should no better then to not have a back up set with me. MNPublius has some photos up as well. Crash Collision Trio kept the crowd entertained. Amy pointing out her family to the Senator. Amy and John enjoying the warm embrace of the welcoming audience! I'll be venturing down the road to the State Capitol in a bit. It not too late to visit Amy's site and print out your ticket, too! With gas prices in Minnesota reaching an all-time high, Minnesota Attorney General candidate Bill Luther served notice that he will not tolerate oil companies gouging Minnesota consumers, farmers and businesses at the pump. The former Congressman called for experienced leadership in tackling this crisis. If anyone had any doubts whether Bill was going to make a serious run, you can cast aside those aspersions. Bill is in this to win, and I suspect he will!! That's pretty much it. Joe needs almost 65% of the remaining votes to pull this off and that just isn't going to happen. Strong reports indicate he is going ahead with his Independent bid with the blessing of the GOP. More tomorrow. I'm pulling for Joe today. The voters in Connecticut should be hard pressed to boot a long standing, seniority holding Senator just because he kissed a sitting President from the opposite party. This is the first test for the Bush White House this election season. Oh Joe's a Democrat, but his ties to the President were enough to fracture his support within the Connecticut Democrats. If this is the kind of treatment the electorate is giving a Democrat with loose ties to the White House, makes you wonder how they'll treat the Lock Step Republican candidates. We'll find out by midnight! But I'm still pulling for Joe! In Georgia, Rep. Cynthia McKinney, who made headlines this year for a scuffle with a U.S. Capitol Police officer, faced a runoff for her district's Democratic nomination (ed- and she's down 13 in the latest poll). -snip- McKinney, the state's first black woman in Congress, once claimed the Bush administration had advance knowledge of the Sept. 11, 2001, terror attacks. In March, she struck a Capitol Police officer who did not recognize her and tried to stop her from entering a House office building. A grand jury in Washington declined to indict her, but she was forced to apologize in the full House. She drew less than 50 percent of the vote in last month's primary and faced Hank Johnson, the black former commissioner of DeKalb County, which encompasses much of Atlanta. In a radio ad, McKinney acknowledged that she's "not perfect. But I've worked hard, told you the truth and I'm not afraid to speak truth to power,'' she said. —In Colorado's heavily conservative 5th District, voters chose among six GOP candidates to succeed retiring Republican Rep. Joel Hefley, a 10-year veteran. The winner will face Democratic Air Force veteran Jay Fawcett. In another race, three Democrats competed to replace U.S. Rep. Bob Beauprez, the Republican nominee for governor. —Michigan Republican Rep. Joe Schwarz faced a serious challenge from former state lawmaker Tim Walberg (ed- Walberg leads Schwarz, 37-34 ). Schwarz, a moderate Republican, was backed by President Bush, Arizona Sen. John McCain and the National Rifle Association. But the race was dominated by a struggle over GOP principles. Outside groups have spent more than $1 million on the race. —Missouri Republican Sen. Jim Talent and Democratic challenger Claire McCaskill, the state auditor, were expected to win their party's primaries. Voters will also decide whether to renew a 22-year-old sales tax to fund state parks and other conservation initiatives. Noah leaked out in the birthday greeting to my dad that his birthday is today. What better gift then to tell you all about his new blog. It is a level headed look from the left. I think even the Righties will be able to appreciate his objectivity and candor. I know it's not much, Noah, but its the thought that counts, right! Embattled U.S. Rep. Bob Ney, R-Ohio, announced Monday that he would retire at the close of the 108th Congress, abandoning a bid to win a seventh term to the House of Representatives in November. Ney, 52, whom the Justice Department is investigating for dealings with convicted lobbyist Jack Abramoff, said the decision to step down at the end of the year "ultimately ... came down to my family." Whenever they pull out the 'family' card, you know that there is more trouble ahead. Bob was in Ohio's 18th and was in a serious fight. It will be interesting to see if the new GOP candidate rebounds, or if the electorate is fed up with the corruption they have had to endure. the contingency planning has already begun inside the White House and the Pentagon. President Bush will move U.S. troops out of Iraq if the country descends into civil war, according to one senior Bush aide who declined to be named while talking about internal strategy. "If there's a full-blown civil war, the president isn't going to allow our forces to be caught in the crossfire," the aide said. The administration hasn't made its definition of full-blown civil war explicit. But in March, when Iraq's former prime minister Ayad Allawi said the country was already fighting a civil war, Bush disagreed, noting the existence of Iraq's nonsectarian Army and government. If the country did someday meet the definition of civil war and the U.S. pulled out, military officials warn, the consequences would be disastrous. "All the neighboring powers would be drawn in," said one senior military official who has examined the scenarios and is not authorized to speak on the record. "It would become a regional war." The mess just keeps getting messier! Hereby and forthwith . . . The Blogging Caesar has fired up his Election Projection website for another go around. Election Projection was a must read for Wonks during the 2004 presidential election cycle. His electoral college map with projections was posted on the sidebar here at Centrisity during the campaign. Now he has three maps to look at, Gubernatorial (21 GOP -7, 29 DEM +7), Senate (51 GOP -4, 48 DEM +4, 1 IND), and House (226 GOP -7, 209 DEM +7, 0 IND -1) breakdowns. Caesar is an admitted Right leaner, but I find him to be objective and intelligent in his analysis. I'll be visiting him daily for the latest polling news and analysis. Somedays, you may not want to wait for me to share what I find, so go visit him yourself. "President Bush had his annual medical exam this week. The doctors said the president remains in excellent health and is fit for duty. In fact, so fit today the National Guard called and said, `So how about serving your time now?'. Ted Thompson sent out a message today announcing Bill's website and request for support. Complete text available at Luther v Johnson. Ted was Bill's former Chief of Staff. He shared some thoughts in a comment thread soon after Bill announced. It deserved it's own posts here. Our latest numbers from Minnesota (Klobuchar +12), Washington (Cantwell +11), and New Jersey (Menendez +6) provide Democrats with breathing room in the three Senate races deemed by the conventional wisdom and polling data as the GOP's best pick-up opportunities of the cycle. In all three cases, polls earlier in the year gave Republicans hope but the trends are moving against them. With all the usual cavaets about a long time until Election Day, it is now hard to see the Republicans picking up any Democratic Senate seats. Rasmussen is a Right leaning pollster whom both sides of the aisle typically agree are the most accurate out there. Let's see the Kennedy attack machine spin out of control now. UPDATE: KvM 'had' a post up on this, but the link off the MNSpeak aggregator is dead. They must not have gotten the spin right from their 'bosses'. Expect tweaked text and a more viscous title in 5 . . 4 . . 3 . . There is always dispute over my moderate credentials. I've never denied the fact that I do lean Left, my tag line above says as much. But my ideology aligns more to the Right of the DLC, or very close to the Right's favorite Democrat Joe Lieberman. I was a Lieberman supporter during the last Presidential election cycle. And when he didn't get the nod, I had to look at the two remaining endorsed candidates and chose one that I felt was a better fit for my views, and the best hope for the future of the country. It was the lesser of two evils, and one was significantly more 'evil' then the other. I went with Kerry. We all know how that worked out. Now Joementum is in the political battle of his life. The dissatisfaction of the Bush administration, and Joe's tight alignment with it, has created a wedge in the deep blue state of Connecticut. 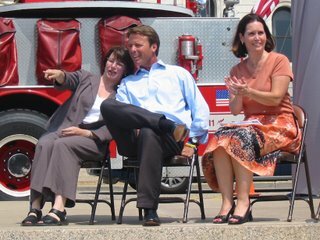 So much so that this long serving incumbent Senator will no doubt LOSE the Democratic primary on Tuesday to political unknown Ned Lamont. The latest Q-Poll not only confirms other polling, but continues to trend against Joe. What is incredibly interesting, is what would happen next, especially when Joe does lose the Democratic nod. He is already compiling the necessary signatures to run in the general under his own independent 'Connecticut for Lieberman' party. Rasmussen did some polling on this electoral make-up and the results were interesting. With Joementum ebbing, it looks like the trend lines spell doom for Joe even if he runs under his own label. That could spell political suicide for him, but open the door to the GOP where I am sure the President will find a home for him. If I were a Connecticut voter, I would support Joe in the Primary, but I am not sure if I would be able to continue that support should he lose to Lamont. All eyes will be on Connecticut next Tuesday for what will turn out to be an interesting evening. So how are your property taxes? Any smokers out there? How about anyone who has bought a fishing license or a hunting license or a marriage license or a car license in the last four years? Anyone have relatives in a nursing home? Anyone notice that all of these things have become much more expensive in the last four years? My mother has voted straight ticket Republican her entire life. She won't be voting for Pawlenty this year. She thinks he's "a liar". I wonder why that is? The Estate Tax is a terrible thing that destroys small businesses and family farms and must be done away with permanently. A recent Federal Reserve Survey of Small Business Finances indicates that the average net worth of small businesses is $702,566. Only 4 percent of small businesses have a net worth of more than $3.5 million, the amount exempted from taxation by 2009, thereby exempting 96 percent of all small businesses. The USDA’s Economic Research Service reported that the average farm household net worth ranged from $576,400 for small farms to $1.5 million for very large family farms. The estate tax already exempts $2 million of all estates, and the exemption level rises to $3.5 million by 2009 (double for couples). The New York Times has reported that the American Farm Bureau could not cite a single case of a family farm lost due to the estate tax. Yeap, for a tax that is destroying family farms, not a single case was discovered to support the claim of destroying even one. Myth: Many average Americans people are hurt when forced to pay the estate tax. Reality: 98 of every 100 people who die face no estate tax whatsoever. Only the super-wealthy – the richest 2 percent of Americans – are subject to the estate tax. By 2009 when the exemption level rises to $3.5 million, it is estimated that less than one-half of one percent of Americans will have to pay the estate tax. Yeap, half of one percent. And the revenue lost if the tax is repealed that will protect the mega rich will have to be spread out amongst those whom the Right are actually trying to protect. So we can debate the punitive nature of this tax if you'd like, but don't let anyone tell you that it is destroying small businesses and family farms. This is nothing more than GOP smoke and mirrors so that their Richie Rich friends* have more money to donate to their campaigns. *an estate tax repeal would save the estate of Vice President Cheney between $13 million and $61 million, according to the publicly available data on his net worth. It would save the estate of Defense Secretary Donald Rumsfeld between $32 million and $101 million. The estate of retired Exxon Mobil chairman Lee Raymond would pocket a cozy $164 million. As for the late Sam Walton's kids, whose company already makes taxpayers foot the bill for the medical expenses of thousands of its employees, the cost to the government for not taxing their estates would run into the multiple billions. We heard he was back in the politics biz, working for a certain U.S. senator, who formerly occupied the same office the elder Kelly had until January. Word is he’s doing some outreach for the soon-to-be senior senator from Minnesota. “I’m working for myself,” Kelly told the Scoop this afternoon. On behalf of Sen. Coleman, maybe? “I’ve got several clients,” Kelly said. Erich Mische just called to confirm that Ryan Kelly has indeed retaken the political field. I wonder what Daddy is doing? A federal judge in San Francisco has jailed blogger-journalist Josh Wolf, age 24, for refusing to turn over videotapes he took at an anti-capitalist protest last year and to testify before the grand jury. The protest, tied to a Group of 8 meeting of world economic leaders in Scotland, ended in a clash between demonstrators and the San Francisco police, with one officer sustaining a fractured skull. A smoke bomb or a firework was also put under a police car, and investigators are looking into whether arson was attempted on a government-financed vehicle. ....Mr. Wolf, who posted some of the edited video on his Web site, and sold some of it to local television stations, met with investigators, who wanted to see the raw video. But Mr. Wolf refused to hand over the tapes, arguing that he had the right as a journalist to shield his sources. There is also a plea from his Mom, who is now posting on his blog, for fiscal assistance with the legal expenses. Its fish or cut bait time for this young 24 year old. What he needs is good, sane, and sensible advice from counsel that doesn't have a dog in this fight. I hope he finds it.